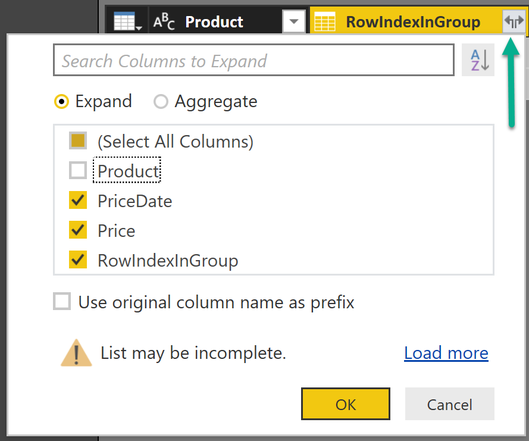 There are a lot of situations where it becomes necessary to reference one particular row or a group of rows that are somehow related by their position to the current row of a table in the Tabular model, no matter if this model resides in SSAS, in Power Pivot, or Power BI. But unfortunately this is not that easy, as it is in Excel, where we can use relative or absolute cell references. And another very important fact that we always have to keep in mind, a row in a table is not aware of its own position in the table. 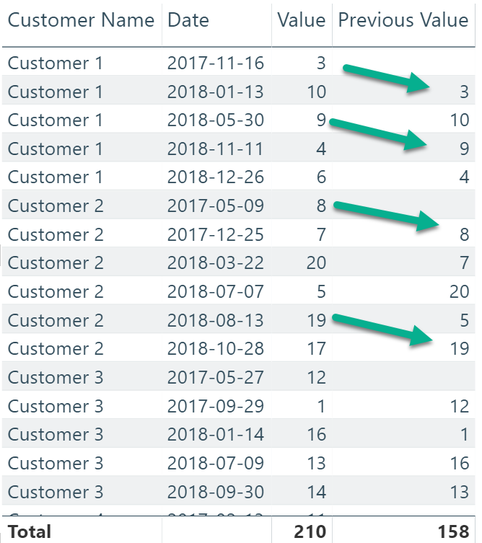 One question that surfaces quite often in the Power BI community (community.powerbi.com) also in different forms, is a question like this: "What is the previous value of …"
Please keep in mind, that the task to answer this question can become quite difficult, depending on the nature of your table and how the rows are organized (meaning ordered) inside this table. The table above shows price adjustments for some products over time. The name I provided as "New column name" is not important because it will not surface but it's mandatory to use the Operation: All Rows. This Formula adds an IndexColumn to each table, whereas the the table is ordered by the column Pricedate. The arguments of the function "Table.AddIndexColumn" are, table, name of the new Indexcolumn, the value to start with, the increment. 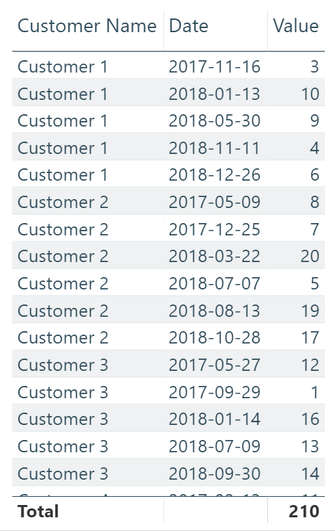 Sometimes, from my experience most of the time, the naïve approach can't be used, because it's not possible to rely on a unique row identifier, because the row numbering will change due to interaction of the user with slicers, leading to not contiguous values in the filtered table. In this case I use the following approach. Because due to my experience that most of the time I'm looking for a certain value at previous point in time, I will use some date / time related wording, but of course this can be adapted to any question, as long as it's possible to order the dataset. This approach is solely using measures, there may also be solutions that to some extent can also use calculated columns, but due to the fact that I'm currently facing really large tables I'm trying to avoid the additional footprint of calculated columns. And I'm sure that the solutions presented here can be optimized for certain scenarios. My Power BI Desktop file that I'm using here is using sampledata. This sampledata is created by the DAX function GENERATESERIES(…). For this reason you may encounter different values, but this approach allows (at least to some extent) to scale the number or rows used in the tables. This gives me some clue how my calculations behave if the table size grows.